When that old English playwright said the pen was mightier than the sword, it’s safe to assume that he’d never considered the paintbrush. Especially not Dwayne Szot’s style of paintbrush. 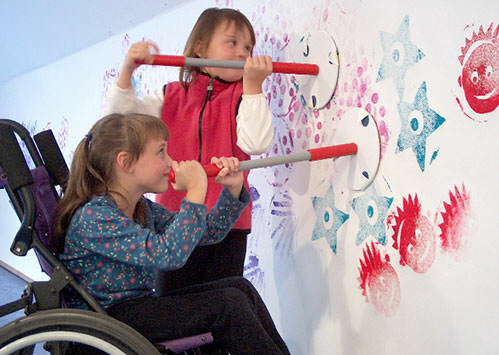 Because had the writer ever witnessed the profound effect on the children whose wheelchairs have been literally transformed into giant paintbrushes, that play would have gone a whole different way! Both artist and engineer, Szot has leveraged his natural creative and mechanical abilities to launch Zot Artz Arts for All, an organization whose mission is to bring art (and the myriad of benefits that comes from creative self-expression) to children and adults with disabilities. 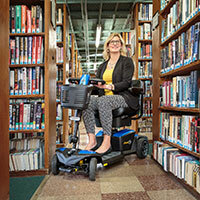 Zot Artz has created a line of innovative assistive technology products, some which can transform a person’s mobility device into tools that can create huge brush or chalk strokes. There are also Pogo Paint Poles, handheld rollers, sponge templates and other devices to ensure accessibility on a broad scale. Through their services, programs, art tools and supplies, Zot Artz has opened the doors for individuals of all abilities to creatively express themselves. Szot’s approach is a bit different from others who serve the Community. “Rather than finding ways for people with disabilities to participate in activities for non-disabled people, we create entirely new activities and projects for people with disabilities and invite those without disabilities to join in,” he said. It’s all fun and games, but at the same time, each person is adding to their individual skill set. Zot artists are developing greater physical dexterity and motor skills as well as improving their social interactions. They are honing their powers of concentration and ability to stay on task. They are refining sensory input processes and building self-esteem. But, most of all, they are having a blast! Szot credits his life’s work to his experiences growing up in a foster home with two siblings who had cerebral palsy. He saw firsthand the challenges that they and others with disabilities in their home faced, and gained considerable respect for their efforts and triumphs. He went on to pursue an advanced degree in fine art where his course of study wove his two passions—art and mechanical design—together. As he designed and built machines that extended his own artistic vision to huge surfaces, he never forgot about his foster brother and sister. Why couldn’t they make a mark like him? The inspired result was the design and production of the very first “painting wheelchair” and the rest, well, it’s history. For more than two decades, Zot Artz has created hundreds of special art events around the world, and helped schools, museums, residential and day centers, independent living centers, park and recreation programs and others put the art tools to work in their programs. 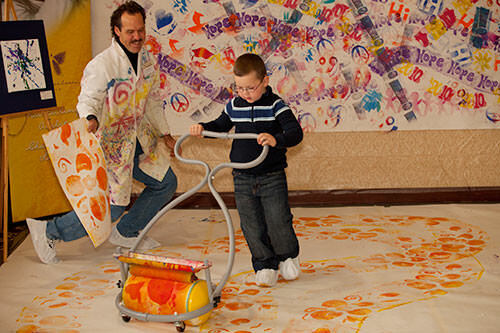 The artists that benefit from Zot Artz range from preschoolers to seniors and include with a wide range of disabilities—physical, hearing, visual, behavioral, learning and developmental. Specific conditions include cerebral palsy, autism, muscular dystrophy, cystic fibrosis, injuries, spina bifida, congenital disabilities and many more. At the Chicago Abilities Expo this weekend (June 29 – July 1), Zot Artz is offering children of all abilities the opportunity to create and take home their own masterpieces. For families whose children are participating at the Expo, a donation of $5 per child is suggested to cover costs and there is a limit of one print per child while supplies last.